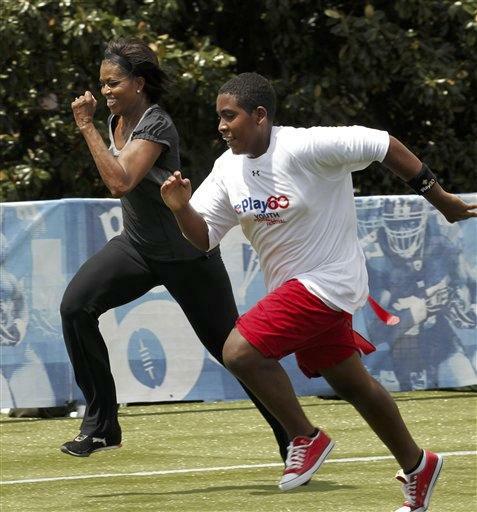 WASHINGTON (AP) - Michelle Obama says she talks about her love of french fries so people won't get the idea that her anti-obesity and healthier eating campaign is all about "complete, utter deprivation." "The message has always been about balance," she said Tuesday. The first lady, who celebrates the first anniversary of her "Let's Move!" campaign on Wednesday, said she tells daughters Malia and Sasha that if they eat vegetables at every meal they'll "still be OK" when they're downing pizza and ice cream with friends on the weekend. "The problem is when that fun stuff becomes the habit. And I think that's what's happened in our culture," Mrs. Obama said. "Fast food has become the everyday meal." "We flipped the script. As opposed to pizza being the treat, it is the thing that kids eat every day because sometimes that's all they eat," she told reporters at the White House. With the campaign, the first lady - who has said publicly several times that french fries are her favorite food - is trying to flip the script back in the opposite direction. One in three U.S. children are overweight or obese, putting them at greater risk for diabetes, high blood pressure and other medical conditions. The campaign aims to reverse that trend within a generation so that children born today can reach adulthood at a healthy weight. So far, beverage makers, food manufacturers and most recently, Walmart, the country's largest retailer, have promised to cut the levels of salt, fat and sugar in their products. A new child nutrition law also puts Washington in charge of deciding what kinds of foods are sold during the school day. To mark Wednesday's anniversary, Mrs. Obama was appearing on NBC's "Today" and "Live! With Regis and Kelly," followed by a trip to the Atlanta area to visit a school and give a speech. She also was unveiling a series of public service announcements to spread the word about "Let's Move!" The speech, she said, will congratulate parents for pressing food companies to offer more nutritious foods and to encourage them to keep on pushing for improvements. "Ultimately this issue is on us," the first lady said. "We're the ones who make the decisions about what our kids eat." And what was that about french fries? "I like to talk about my obsession with french fries because I don't want people to think that "Let's Move" is about complete, utter deprivation," she said. "It's about moderation and real-life changes and ideas that really work for families."